Lloyd's Military Campaign Charts, showing the principal places of interest, compiled from official data by Gen. E.L. Viele and C. Haskins. Published under the auspices of the American Geographical and Statistical Society. Virginia. 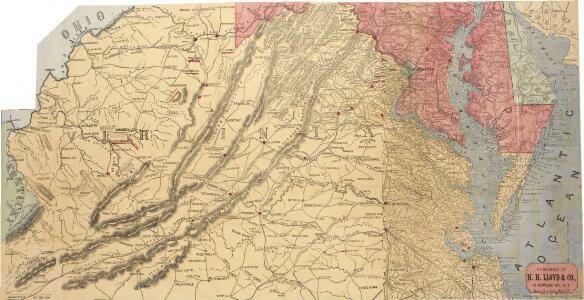 Del., Md., Va., W. Va.
Map of Virginia, Maryland and Delaware / I. Mutlow sc. 6 James St. Covt. Gardn. Pocket Map, showing the probable Theatre of the War. Compiled by G.A. Aschbach. Published in Philadelphia, Pocket Map Showing the Probable Theatre of the War, complied by G.A. Aschbach, details the states of Virginia, Maryland and Pennsylvania. Published in 1860, before any major fighting had occurred, this map highlights areas that would see the bulk of fighting in the conflict. The map shows the balance on military power on either side by pointing out camps and forts. The Union held military bases are underlined in red, while Confederate holdings are in blue. The map also shows railway lines running across the states. 1 : 1340000 Akádie Moll, Herman Homannianis Hered. Lloyd's official map of the State of Virginia. 1 : 650000 Lloyd, J. T.
A map of the most inhabited part of Virginia: containing the whole province of Maryland with part of Pensilvania, New Jersey and North Carolina / drawn by Joshua Fry & Peter Jefferson in 1775. A map of Virginia: formed from actual surveys and the latest as well as the most accurate observations / by James Madison; drawn by Wm. Davis; with extensive additions and corrections to the year 1818. A map of Virginia: formed from actual surveys, and the latest as well as most accurate observations / by James Madison, D.D., president of Wm. & Mary College. ; drawn by Wm. Davis; engraved by Fred. Bossler, Richmd. 1 : 1200000 Mitchell, Samuel Augustus Jr.
Map of Virginia, Maryland and Delaware. Map Of Virginia And Maryland. Description: Lloyd's Military Campaign Charts, showing the principal places of interest, compiled from official data by Gen. E.L. Viele and C. Haskins. Published under the auspices of the American Geographical and Statistical Society. Virginia.